A virtual elementary school has agreed to shut down its kindergarten through 5th grade program after receiving a 1-star rating in a recent state evaluation on student achievement. Nevada Virtual Academy sent a notice home to parents on Sept. 19 that explains the program's low 1-star rating led to a decision not to continue instruction beyond the 2018-2019 school year. The discontinuation affects 447 students, according to school officials. The Nevada Virtual Academy's middle school and high school programs would continue, receiving a 2-star and 3-star rating, respectively. For years, though, the program has been a success for some. "As far as grade wise goes, my kid is reading at almost a third-grade reading level," said Heather Geant. "Her handwriting is that of almost a third grader, she can understand basic math, she can count money, she can tell time and she's got straight A's since kindergarten," added Geant. The closure will impact Geant's second-grade daughter. "Beyond stressed -- it puts more on my plate than I already have," she added. According to the Nevada State Public Charter School Authority, the program's poor performance was on the agency's radar. "The school had a very low performance and both in terms of student proficiency, and more importantly student growth, the number and percentage of students who were not making enough progress to recover some of their academic performance issues," said Patrick Gavin, executive director of the Nevada State Public Charter School Authority. 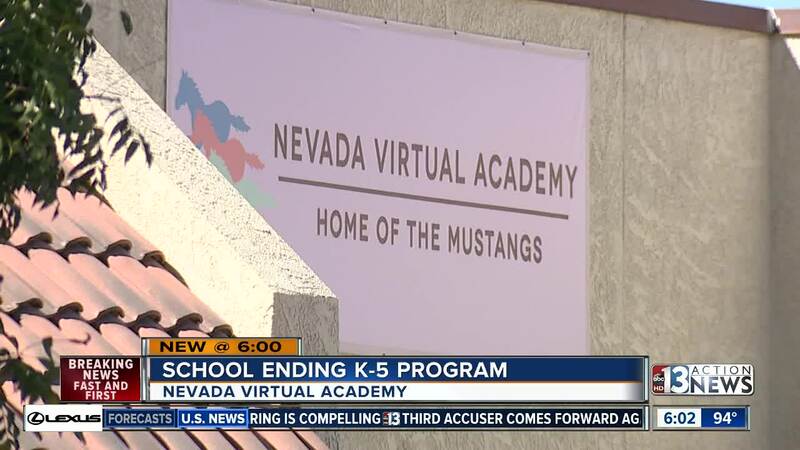 13 Action News requested an interview with Nevada Virtual Academy officials but was told no one was available.